Possibly Wright was not writing for his professional critics to read but to street level secular people who hold a caricature of Christianity as their view of what it is--people who likely never read the Bible and live where almost no one sets foot in a church. I have heard these views you say would not be recognized....but not from Christians...just a thought. Good review, Dane. Thanks much. I wrote my DMin dissertation in "discussion" with NT Wright's works, but before this book. Wright wants scholars and pastors to see everything in the New Testament in the context of Second Temple Judaism (STJ), and he says so directly. Not having done this is the reason everyone, including and especially the Reformers, have got everything about doctrine completely wrong; justification, ecclesiology, hymnology, eschatology - everything wrong. Wright denies the existence of human souls, for example. Wright says directly in his other tomes that the immediate kingdom of God is what the gospels, and especially the Gospel, is all about. This STJ interpretation of the gospels, and Paul, is exactly what Jesus and Paul refused, Wright's argument is not with the Reformers, but with Jesus and Paul! Jesus called the Pharisees, Saducees, and other Jewish factions on their misunderstanding of Scripture. For example, Jesus said the Saducees were greatly mistaken because they did not understand the Scriptures! Jesus challenged Nicodemis, the teacher of Israel(! ), because he of all people should have understood what Jesus was saying about being born again. At His ascension, Tje disciples were still interpreting Jesus' message in light of STJ expectations: "Will you at this time restore the Kingdom?" Jesus did not answer them, instead giving them the Great Commission. Paul, in Acts, went to the synagogues of the cities to present the gospel to them first. They refused to believe, counting themselves as unworthy of salvation, Paul went to the Gentiles who heard him gladly! Wright is very verbose, but that is a mask for his errors in doctrine. Wright greatly errs, he understands the Scripture, but he rejects it's teaching. Trevin Wax interviewed NT Wright a few years ago for The Gospel Coalition in the journal Thelimous, where he asked if indeed the Holy Spirit had allowed the entire Christian church to get the Gospel wrong for 1,500 years, until a certain young Englishman began reading the New Testament in his Greek classes. In 1999, Christianity Today weighed in on the dispute between John Piper and NT Wright on the doctrine of justification, giving a chart with both men's views of Justification in the magazine. Not only is this book problematic, the entire corpus of Wright's works are so. I haven't read this book yet, but I have read several of Wright's other books and articles and can attest that the false dichotomy seems to be one of Wright's favored rhetorical techniques. So glad to see Crossway has such clear headed young thinkers at the helm. Are we sure that NT Wright is saved? And what evidence is there for that? Didn't Jesus promise that the Holy Spirit would guide us in all truth, and aren't we told that 'we have the mind of Christ'? If God were truly illuminating NT's thoughts on Scripture, how could he be so wrong -- and write so eerily like Brian McLaren? To a young person who's a fairly fresh convert (5-7 years), this is enough of a stumbling block for me that I wonder if it isn't devastating to the less theologically learned within the universal church? It baffles me why solid theologians refer to Wright as if he simply must be one of us. Could it be that the church's discernment crisis does indeed affect the leadership as well? This is a continuing concern for me. Thanks, Dane, for the review. I too share your appreciation for Wright, but was also disappointed with this book. I got the sense that it was very quickly written and not thought out in the same depth as some of his other writings. Dear Dane, thanks for this helpful, clear, and concise review brother! Excellent, but no doubt difficult to write. I'm just in process of reading this book but strangely (I'm in UK) my cover clearly says Tom Wright (not NT Wright as in review cover). This is the name he often writes under for his less academic works so perhaps the first poster is on the right track in suggesting he is writing for a wider readership. "Wright is very verbose, but that is a mask for his errors in doctrine. " I'm not a Wright expert, but it seems to me that lack of clarity is not a good thing or a good sign. As Jewish grandmothers used to say in the first century " Again vit the strawman arguments?" I have read several of Wright's books and have found them mostly profitable, however not without points of disagreement along the way. 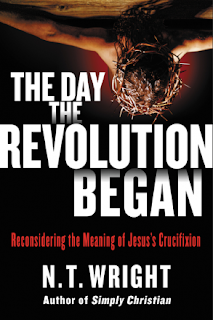 But his latest work (of which I haven't yet read and probably will not after reading the above review) leads me to seriously question where Wright's Christianity is evolving, or maybe devolving. To not explain the biblical purpose of the crucifixion with clarity and confidence is beyond acceptable for an author of Wright's statue and influence. It's these types of negations that brings Wright criticism, and well deserved at that. If this is where Wright is moving I wouldn't hold my breath expecting his next book to be anymore inspiring or encouraging for the believing reader. Thank you for your review. Having some familiarity with Wright's work (and with the caveat that I haven't read this one), I believe you are misrepresenting him. This seems to be one of his more popular-level, as opposed to academic, works. My impression of such writings are that they are often intended to challenge the prevailing cultural worldview of Christianity being about going to heaven if you're good and going to hell if your bad. That is, a disembodied state of dull bliss as reward for morality (or being in the club) or a disembodied state of fiery torment as punishment for immorality (or being outside the club). It seems to me that Christians can be as guilty of such lazy thinking, governed by culture rather than Scripture, as non-Christians. As such, I believe that Wright's intent is to get us all to think more carefully about our preconceptions. I know for me that the understanding of 'heaven' not being the end point, but rather an intermediary state before God creates a new earth for us, was revelatory. And surely we should think about eternal life starting now on earth, as part of God's kingdom which he established with the death and resurrection of Jesus, rather than something that happens after death? Is that not what John is getting at in his gospel when he recounts Jesus saying that eternal life is knowing God and his son (John 17:3)? That said, your criticism that Wright is vague about what the cross does sound fair, although I can't comment in detail as I haven't read it. I don't think the 'false dichotomies'or 'caricatures' criticisms are warranted though. As a fan of NT Wright it's tough to read a serious criticism of him but I thank you for doing that. I have learnt the best way to honour your heroes is to engage and challenge them, something Wright has been doing for much of his career and he has expressed the desire for others to do the same to him. I believe the enduring legacy of Wright's will be the critical discussion of his body of work which will last for years if not many decades to come. I find it quite interesting when someone effectively points out the flaws and deficiencies in his work people jump on the bandwagon to question everything including his faithfulness to Christ. If Wright was perfect I'd have a serious problem with that. In spite of his prodigious talent he is as human as we all are. I, too, appreciate Wright's work and have read at least two or three of his books. (I am reading The Challenge of Jesus again right now.) His focus on the historical context of the first century has led me to pursue New Testament history much more fervently in my personal studies; and his fine observations of words like "charcoal fire" in the Gospel of John have driven me to read the biblical text more closely. I have not read the book mentioned in this review, nor have I read Horton's review of it. What does Wright say about Jesus as a "second Moses," a mediator of a new (or at least renewed) covenant? Moses went up a mountain to intercede for God's people and even was ready to lay down his life for them (e.g., see Exodus 32, where God was angry with the Israelites over their idolatry with the golden calf). So also Jesus went up a hill to make intercession for God's people, laying down his life for them and reconciling them to God (see Romans 5:6-11). Is this missing from Wright? Thanks for the comments. Have yet to read a book of his, having only come across some of his videos and from http://ntwrightpage.com/2016/10/21/saving-the-world-revealing-the-glory-atonement-then-and-now/ I figured he dances around the subject but has not analyses it from a logically coherent angle that puts the sin in context of the crucifixion. What is our sin? Jesus death as a substitution for the judgement of our sin is a logically incoherent interpretation, particularly as we continue to sin. First of all the Abrahamic God is distinguished from the other Gods in that he does not accept human sacrifice any more. And if you believe Jesus to be God, a God that kills himself to pleasure himself is not logic unless you want, like the late Hitchins, declare God to be a wanker. Similarly a God angry at his own creation could only be angry at himself as it was his creation after all, thus indicating it to be no good. That only leaves us the option to understand that Jesus died for us on the cross to show us that our sin is resolved if we submit ourselves to God again, even if he asks us to go through a very difficult path ending in physical death. He showed us what we can endure if we have faith in God and that he is with us - even in our darkest hour. Blessed are those who can recite a psalm when on the cross. To understand the whole story one has to understand the story of the fall and what the sin is, that we are all guilty of and that we inherit from Adam and that makes us different from the animals. If you are a parent, you should understand the subtle poetic description of puberty, the rejection of the authority over the self by eating from the tree of self realisation. It comes with the realisation of their "private parts", that they suddenly worry their bits to fall of if their parents see them naked in the shower. By realising the individual self one puts oneself in conflict with God and creation and therefore with eternal existence. Mortality is a logical consequence of realising your material self as you become subject to time and deterioration in your material body. God asks them not to eat from that tree as he knows what the logical consequences of this step are. He does not say "if you eat from that tree I will kill you, but - you will certainly die - as only as a separate part you die. Otherwise you remain part of the system. He tells them a fact like you tell your child not to touch the high voltage cable as you will certainly die. Let me try to answer your question of "how". There is no answer because they didn't ask the question. Your question wasn't a question that a pre-enlightenment bronze-age person would have thought of. I believe the Israelites borrowed the concept of sacrifice from their surrounding neighbors and also did not ask the question of "how". Nobody asked "how" for thousands of years because this was not a question that occurred to them, sacrifices to the gods to gain favor was universal. When Jesus died his death was seen as a sacrifice to God, this was a perfectly natural assumption to make for his followers. Still, they need not answer the question of "how" because they never asked it. Now us modern post-enlightenment folks are looking back in time trying to understand a salvation program invented by people who had a completely different thought process as us. To understand them we must think like them. What makes you think that you understand the thought process of bronze age man? In a culture where human sacrifice to God was frowned upon as that was something the barbarians did, people might have had much more revolutionary thoughts than what we credit them for. Why would they not have seen Jesus to sacrifice himself not to please God but to die for God in the sense that we can understand that we do not have to fear God and death any more. They were thinking far less materialistic than we do. "Sometimes the caricature is so misleading as to actually say the opposite of what evangelicals believe. For example: 'The common view has been that the ultimate state ("heaven") is a place where "good" people end up, so that human life is gauged in relation to moral achievement or lack thereof' (p. 147). Yikes. Heaven is for the morally good people? This is gospel confusion at its most basic. This is the same error my 4-year-old tends to still make but which my 6-year-old and 10-year-old now know to be error. From one of the world's leading NT scholars?" You center on on Wright's sentiment regarding "good people", but you take it completely out of context. In context of Wright's larger argument, he is making the case that, even if one chooses not to recognize it, this is the idea that common approaches to atonement in traditional theology really end up saying. He is not saying that traditional atonement believes we can "earn" our way to heaven. In context he is saying that by viewing the work on the cross in the way of penal substitution, we end up translating the goodness of Christ Himself as the means by which we enter Heaven. The problem is that traditional theology still reads this "goodness" in terms of moral achievement. It focuses on the the idea that Jesus is morally perfect, and in the subtitutional work we become perfect enough for God to accept us into Heaven. So Wright is not saying what you represent him to be saying above. He is not saying that traditional approaches to atonement theology believe we earn our way into heaven based on moral achievement. He says quite the opposite actually. Rather, he is saying we haven't moved far enough away from moral achievement, and it is taking away from what he believes is a more scripturally sound approach to atonement. Your review above is full of these kinds of misrepresentations. Re the above comment, I don’t think it’s fair to dismiss Dane’s criticisms as misrepresentations. Dane quotes Wright’s premise as follows: “The common view...[is] that the ultimate state (‘heaven’) is a place where ‘good’ people end up”. This is exactly what Wright says, yet it simply isn’t a premise held by any evangelical Christians. Besides, if all Wright wants to take issue with is the ‘works versus vocation’ issue, then the premise “The ultimate state (‘heaven’) is a place where ‘vocationally-centred’ people end up” doesn’t sound so much better.